In 2-quart saucepan, mix granulated sugar and cornstarch with whisk. Stir in cherries, reserved juice, the orange peel, orange juice and butter. Cut slit down center of vanilla bean; scrape out seeds. Add seeds and bean to cherry mixture. Heat to boiling; boil 1 minute, stirring constantly. Pour into shallow container. Remove and discard vanilla bean. Refrigerate until ready to assemble. Meanwhile, on lightly floured surface, roll 1 pastry round or pie crust to 1/8-inch thickness. With 5 1/2-inch heart-shaped cookie cutter, cut out 6 hearts. Place on ungreased cookie sheet. Repeat with second pastry or pie crust. With 1 1/2-inch heart-shaped cookie cutter, cut out small heart from center of second batch of hearts. 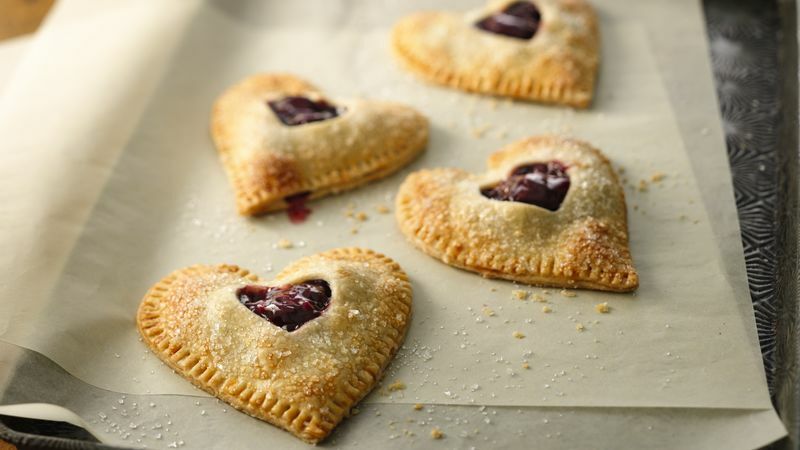 Spread 2 tablespoons filling on each plain heart. Cover with cutout hearts so filling shows. Press edges together with fork. Refrigerate 1 hour or until firm. Heat oven to 400°F. In small bowl, beat egg and whipping cream. Brush over hearts. Sprinkle with coarse sugar. Bake 25 to 30 minutes or until lightly golden. Remove from cookie sheet to cooling rack; cool at least 30 minutes before serving. Sprinkle the pies with powdered sugar after baking for a different look. If a vanilla bean is not available, substitute 1/2 to 1 teaspoon pure vanilla.